A Multi-time approach towards trading is essential for proper timing of your trade. This is because support or resistance in higher time frames can cause a reversal to your anticipated trade. 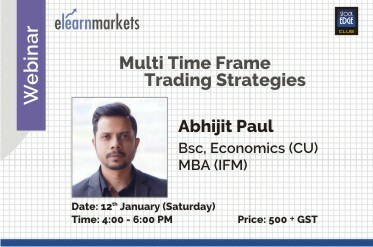 In this webinar, we will learn how to decide upon multiple time frames and which tools or indicators to use in which time frame. Decide how to choose different time frames. Use multiple time frames to time your trade entry best. A look at multiple time frames will also help you to exit open trades better. How to decide which time frames are best for trading. Which indicators to use and plot ins which time frame and why. Swing Trading strategy using 3 different time frames. Basic understanding of Technical Analysis.